The courts in Bangladesh have said that 'fair criticism' is permitted, but have at the same time often taken an approach which narrowly construes what it considers to fall into this category. As a result, it is difficult for journalists in Bangladesh to write commentary on the judiciary in Bangladesh without seriously risking contempt proceedings being issued against them (and their editors/publishers). This is particularly the case when third parties - usually lawyers - are ever so eager to bring any critical commentary to the attention of the courts, which is the case here. This situation is however very different from that in India, where critical commentary - some of it very critical indeed - seems very much to be permitted, and does not create a risk of contempt proceedings. The situation in India seems to be getting closer to the one in England where the offense of contempt by 'scandalizing the court' has been repealed. Today, for example, The Wire had published a pretty excoriating piece about the Indian Supreme court (equivalent to Bangladesh's appellate division) which should simply not be able to be published here, even in a toned down version. The article is worth reading in full, but here are the parts of the article (emphasis added) which would not be permitted in Bangladesh. - lets start with the title: "Uphaar and the Curious Case of the Judges Who Wouldn’t Listen". 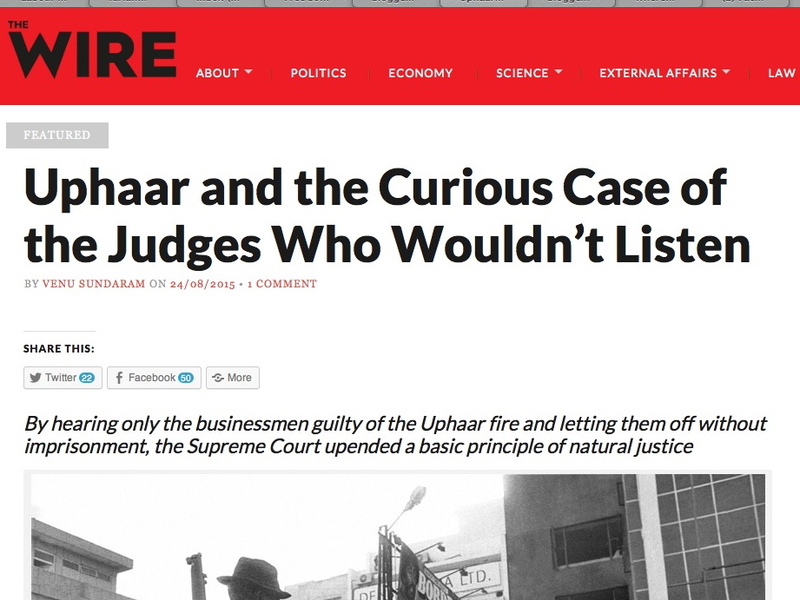 - And then the sub-title: "By hearing only the businessmen guilty of the Uphaar fire and letting them off without imprisonment, the Supreme Court upended a basic principle of natural justice"
- The Supreme Court’s August 19 refusal to hear the CBI and the victims of the tragedy on sentencing is a complete denial of natural justice. - It will be a mockery of justice if the judgment cites only Jethmalani’s contentions, and not the submissions of CBI and the victims on the question of sentence. - The Justice Anil Dave-led bench’s decision is all the more curiouser …..
- In the light of the arguments made by both these judges, the Justice Anil Dave bench’s decision to impose no sentence of imprisonment at all on the Ansals appears completely indefensible. It is healthy for Indian democracy, that the courts - the third pillar of the state - can be subject to informed criticism. And of course the converse would be true for Bangladesh.